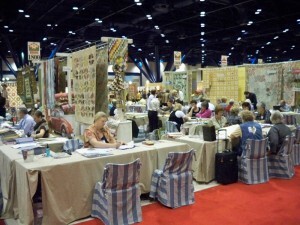 Writing ABOUT Quilt Market while AT Quilt Market is near impossible. The days are long and the free time is short. The WiFi is spotty (unless you are willing to shell out big bucks). So we write what we can via cell phone while on the run, and the bulk of the information has to wait until we get back. 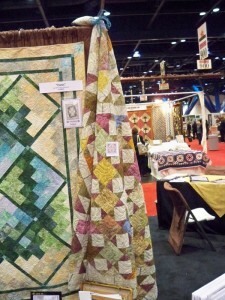 It has been almost a week since we returned from Quilt Market. It has taken us that long to get our various affairs back in order. The orders we took at Market are now processed (Thank you wonderful customers! ), the dirty laundry has been washed, the pictures pulled off the camera, etc. 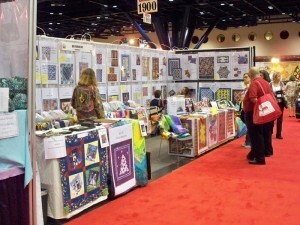 It’s time to share some of the sights of Quilt Market. 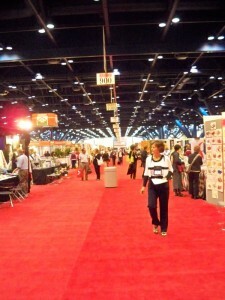 Quilt Market had 20 aisle of exhibitors. Yes, TWENTY!!! It takes a major effort to see everything. 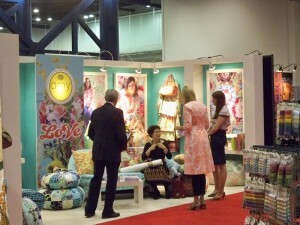 The fabric companies all have huge booths that span aisles. They easily took up most of the real estate. I spotted this quilt in the Northcott booth. It’s our Stoneworks pattern by Ann Anderson using Northcott’s Stonehenge fabric line! It was like finding a friend unexpectedly in a crowd. But Market is not all large booths. The QuiltWoman.com booth took up 3 spaces. We had so many new quilt patterns, we opted to display posters of the patterns and had the quilts themselves piled on the chairs. We refrained from crawling under a table with a quilt to take a nap…although we were sorely tempted. 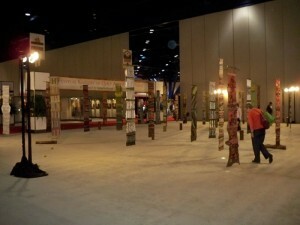 At the south end of the convention center is the quilt exhibit. This is just one small (very small) corner of it. 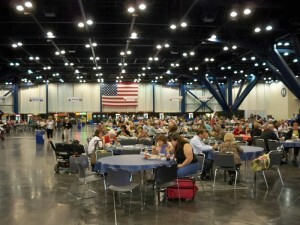 And at the north end is the food court. 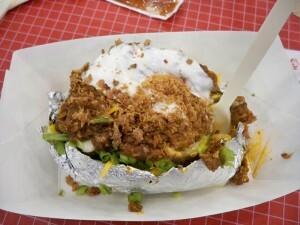 This is the MASSIVE baked potato I had for lunch one day. It was VERY filling! They also had massive taco salads and wonderful BBQ. There are book signings and give-a-ways galore! 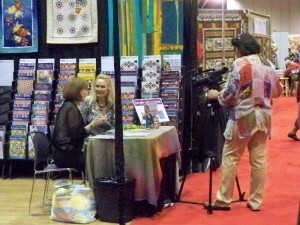 And let’s not forget the quilting celebrity sightings. Here’s Amy Butler (in the long pink and white coat) in her booth. And here’s Alex Anderson (on the far left) giving an interview. And what’s this? 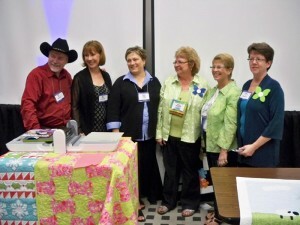 Why it’s our own Nancy Dill (far right), owner of QuiltWoman.com, hop-nobbing with Ricky Tims, Alex Anderson and the AccuQuilt GO! team. 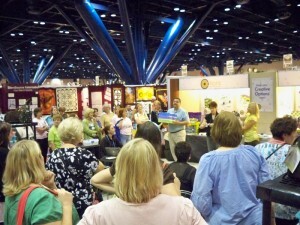 We are currently tabulating the trends we saw at Quilt Market. Those will be in our next posting.